These ProCustom model laser sights fit 1911 compact variants. The rugged polymer side panels feature a stylish burlwood carbon fiber chainmail or walnut pattern. 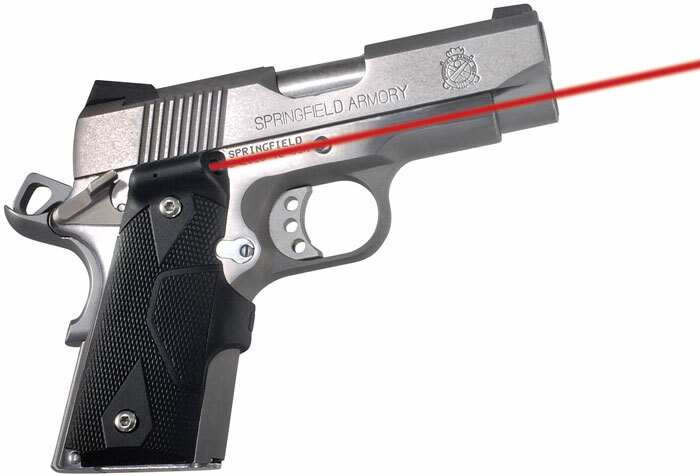 Standard to Crimson Trace Lasergrips they have a rubberovermold button for instinctive activation when held in a natural firing grip. These Lasergrips fit Colt Officer and Defender Kimber compact ultracarry and ultraelite ParaOrdnance compact singlestack Springfield Armory compact and ultracompact Wilson Combat and most other 1911s with grip screws measuring 21116 apart."